While they’re still not commonplace, you’ll find folding shower seats in an increasing number of home showers today. They’re becoming more popular partially because of an overall aging population, but also because there are more options online today that are both functional AND stylish. It’s pretty standard to see built-in stationary benches in a home’s custom tile shower, made of tile to match the rest of the shower. But these kinds of benches do have a few drawbacks. First, the tile can be cold to sit on! Secondly, they are a permanent fixture of the shower, taking up a fair amount of space. So, if you’re limited on space in your bathroom, you may not have the room for a shower large enough to have a built-in stationary bench in it. That’s where a folding shower seat could be quite beneficial. You can fold it down to use when you need it, and fold it up and out of the way when you don’t, freeing up valuable space in a small shower. 1) simply for comfort and convenience, to be able to sit down in the shower for relaxation, or to use as an aid with things like shaving. 2) to have a showering aid for someone who has a disability or physical limitation, or is elderly. If this is the case for you or a loved one, an ADA compliant folding shower seat provides a great way to keep your independence. It’s a safe and practical way to keep your dignity and privacy while being able to shower & clean yourself. There are two main types of folding shower seats to choose between. 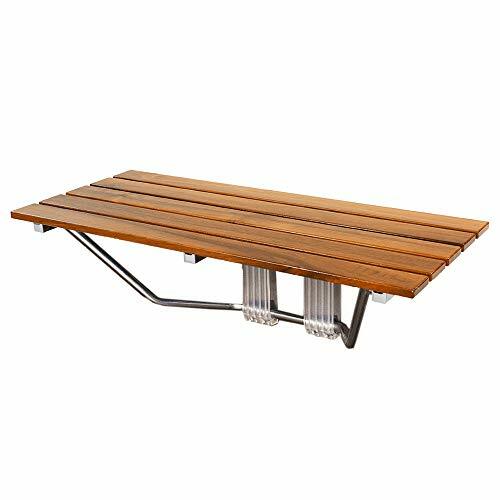 Teak folding shower seats are made with a metal frame (usually aluminum) and teak wood planks for the seat. They usually look the nicest, adding a touch of style to your shower, and are the most durable over time, but may not be the most practical if you need places to grab and assist you like armrests and grab bars. If you want to know more about the benefits and reasons to use teak wood in a shower, check out this other post here on TileShowerDIY about Teak Shower Benches. Seats that are plastic, phenolic, or padded. Sometimes the most practical for elderly or those with disabilities or physical limitations, having arms, grab bars, etc., but they tend to be a little more institutional or medical looking and less stylish. Take a quick browse of folding shower seats available online, and you soon see just how many choices you have (many good, and some bad! ), which can become quite overwhelming. Lucky for you, we’ve done the hard work of sorting through it all for you. We have come up with this list of our top choices, after taking into consideration many factors, including customer reviews, prices, brand reputations, customer ratings, features, and more…so you don’t have to! This model from Moen – a highly trusted company in bathroom & plumbing fixtures – tops our list for 3 main reasons: it has a 4.8 out of 5 star rating on Amazon, is very stylish with the bronze finish on the aluminum frame, and has a high weight capacity of 400 pounds (higher than the standard of 250 pounds). Its combination of natural teak wood & the old world bronze finished aluminum work together to provide a warm, rich, stylish piece that will fit the style of almost any modern bathroom. Customer reviews say that it looks fantastic & beautiful in their showers, and is sturdy & well-built with quality craftsmanship. Some shower seats & benches can be a bit small, but not this folding shower seat from Clevr! At 36 inches wide, it’s wide enough for two! It’s ADA compliant and great for use in a handicapped accessible shower. Getting 4.2 out of 5 stars on Amazon, it’s been well received by many customers. Photos in the reviews section from customers who installed this bench in their house show that it really looks quite stylish and compliments perfectly a wide variety of tiles and shower styles. At less than a $200 price tag, it provides great value for the money. At #3 on our list, this folding shower seat looks much like our pick for #2 in style & design, but it’s 15 inches wide instead of 36…which makes it the perfect compact seat for a smaller shower. It has a 12 inch deep seat made of 4 beautiful teak wood boards. Customers have given this an average star rating of 3.9 out of 5, making it a great value for the price of less than $150. It has a standard weight capacity of 250 pounds. 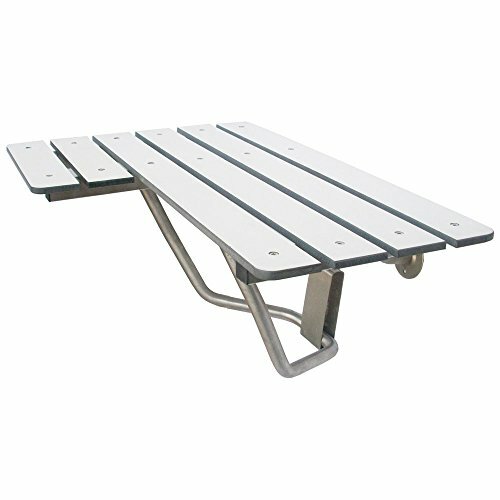 If you need a compact teak shower seat with a chrome finish to match your other bathroom fixtures, this little seat could be the one for you. It’s got a fantastic customer rating of 4.9 out of 5 stars on Amazon, and for less than $150 offers tremendous value. One thing we liked about this model, was its unique style in how it mounts to the wall, not having the support bar exposed below the seat. 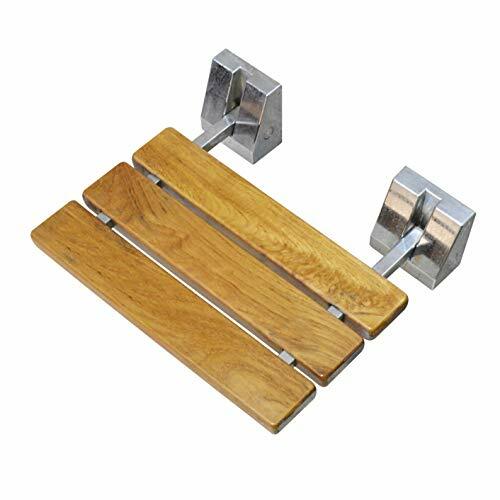 Reviewers have commented that it works great in their small showers, as they love how it folds up out of the way, and the Burmese Teak wood along with the chrome plated aluminum really make it stylish. 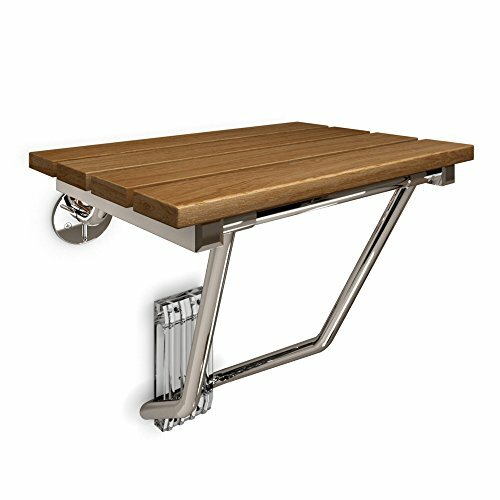 …Not that the teak folding shower seats aren’t functional, as they are, but we had to call this category something! If you aren’t concerned with the seat adding to the style and look of your shower, but just want one that is functional, does the job, is nice and sturdy, and folds up out of the way when you’re done, then these kind are for you. This seat is concave curved to add comfort and stability in sitting. The raised sides have gripping handles to hold on to while showering or during transferring in and out of the shower, and has handheld shower head holders built into each side by the handles. You can rest assured it will support you, having two adjustable legs that fold down to the floor as the seat is folded down from the wall. At under $100, it is one of the least expensive folding shower seats to get such a high rating of 4.7 out of 5 stars on Amazon. One point of caution would be that one reviewer said it began rusting after a few months, so that implies the manufacturer uses a cheaper metal that can rust in the shower, unlike an aluminum frame would. This L-Shaped shower seat – available in both left-hand & right-hand configuration – is great for having toward the edge of the shower and using to transfer in and out. It’s 26 inches wide by 21 inches deep at the longest point of the L shape. 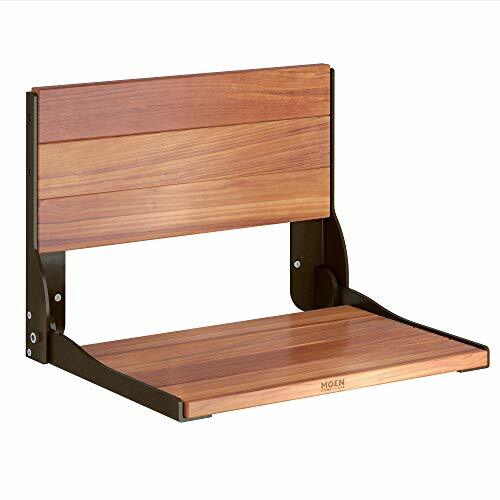 The durable phenolic seat top helps keep it sanitary, and the spaces between slats allow it to drain quickly, reducing issues with mold & mildew. And the stainless steel frame construction will keep it from rusting. 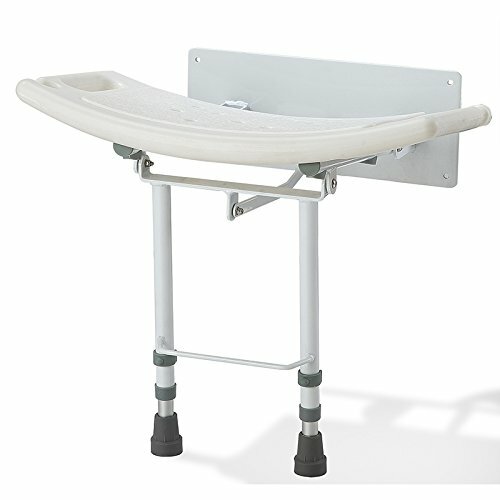 With a rating over 4 out of 5 stars, a price under $200, and excellent customer feedback in the reviews section, it makes a great choice for a functional folding shower seat. This 100% USA-made shower seat has an L-shaped design much like the CSI Bathware model above, except it’s reversible, meaning the part that sticks out can be switch to either the left or the right side. It’s 32 inches wide and 23 inches deep on the long side, with a 1/2 inch thick poly seat on top. The tubular pieces of the frame are stainless steel, and the top is made of poly to give a sanitary surface that cleans easily. Customer reviews and ratings indicate that buyers have been very pleased with this purchase, even though it’s slightly more expensive, they feel they’ve gotten what they have paid for with a sturdy & well-built shower seat. This folding seat is obviously the most expensive on our list, but you get the most features for it. 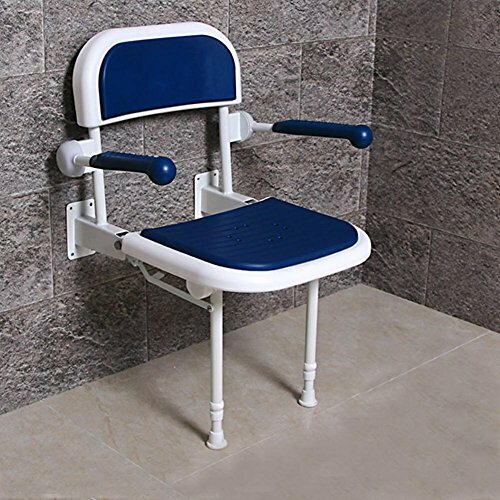 Having a back, armrests, support legs, and a 550 pound capacity rating, it’s perfect for elderly and disabled to be able to take a shower safely and comfortably. It really is quite nice that you can have a complete chair in the shower, but it fold completely out of the way when not being used, arms, legs, seat and all. Installation Note: With all of these folding shower seats being wall-mounted, the hardware that mounts the seat to the wall is holding all the weight placed on it, so you will want to make extra certain it’s installed properly. You can do this easily yourself if you have a moderate level of DIY skills, but if you doubt yourself at all, please hire a professional to install it for you…for your own safety and peace of mind knowing it won’t pull out from the wall the next time you or your loved one sits on it. Always ensure your screws are being driven into a stud behind the wall for full support. If you are installing one of these folding shower seats in an existing tile shower, you may need to remove a piece of drywall from the opposite side of the shower wall, install blocking boards in line with where the mounting hardware for the seat will be on the other side, and have those solid blocking boards to screw into. Again, if this is beyond your skill level, there’s no shame in paying a professional to do it for you!